Fission is the splitting up of a large nucleus to make two or more smaller nuclei. The large nucleus is called the parent nucleus and the small the daughter nuclei. Nuclear Fission is how energy is produced in a nuclear power plant: to make the uranium atom split, it needs to absorb a neutron. When it splits, the uranium becomes Krypton, Barium and two more neutrons. This means that the next time round, two uraniums can split and the next time four. 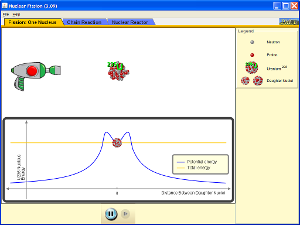 This build up is called a chain reaction and is shown below. 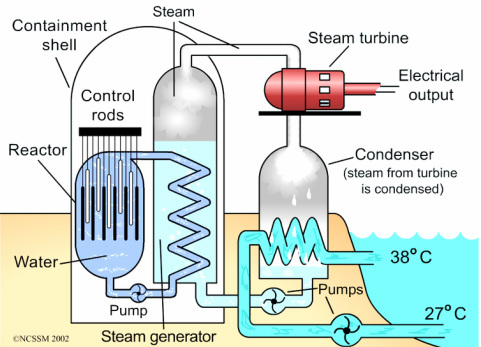 In a nuclear power plant, energy from nuclear fission is used to heat water. This water turns to steam which turns the turbines and generates electricity. The steam is then cooled and returned to be heated again. Important parts of a nuclear reactor are shown below. Control Rods: these absorb neutrons to control the rate of the nuclear reaction. If they absorb more neutrons, the reaction will slow down. They can be raised or lowered to absorb more or fewer neutrons and prevent the reactor from becoming critical. Containment Shell: this will be made of lead to absorb any radiation that may escape from the reactor. In the reactor water is used as a moderator: it slows down the neutrons that are released during fission, heating up and allowing them to be absorbed by other uranium nuclei. This hot water then heats the water that will become steam and turn the turbines. Cold water is used to condense the steam and send it back into the reactor.